THE MOMENT OF TRUTH: First Day Back on Set! “The Moment of Truth” returned to filming yesterday, July 27th, for its second season on FOX, at the CBS studios in Studio City. After sitting in this show for the fist time, I have to report back that, host, Mark Walberg is truly an exceptional host. I have never encountered a host like him. It is apparent that he enjoys his job and loves what he does. Walberg carries himself as a traditional and ordinary family man. In-between his takes, he talked about his thirteen-year-old daughter being at summer camp. A regular family guy, who also happens to host one of the most controversial and top rated shows on FOX. Walberg also revealed that one of his past jobs in the business was as an audience warm-up host. Yesterday, he was repeatedly seen coming off of the stage in-between takes and joining the live audience to converse with them. 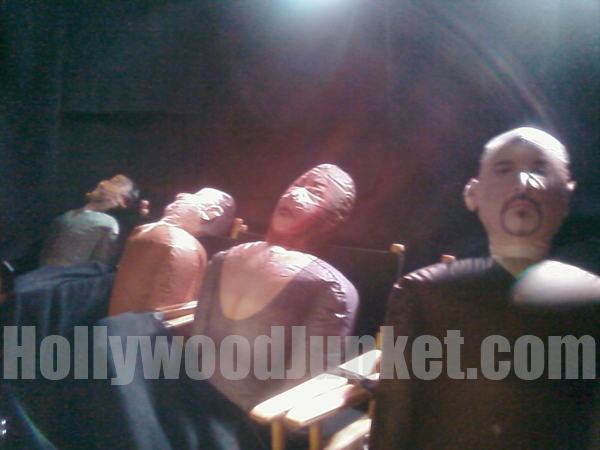 A little tidbit: The very top row of the balcony, contains life-sized blow-up dummies in place of live audience. Prior to the game, contestants are hooked-up to a polygraph exam to answer 50-75 questions about their personal history. Twenty-one of those questions are chosen to be asked again of them during the live taping. Here’s where it becomes sticky for the contestants. The results from the test are not shown to them. So, even if they lied about some of their answers, they must reveal the true answer during the live game, or else it will result in a “false” verdict. That causes them to either lose the money that they have won ($10,000 or $25,000) , or drop back down to $25,000 if they have gone past the $25,000 mark. Also, the show does not reveal the length of time that goes-by from when the initial lie-detector test takes place, to when the contestant appears on stage for the taping of the show. This noted simply for the fact that if any substantial amount of time goes by (at least one month) would be long enough to make the game tougher on the contestants. The first contestant up of the day was a Los Angeles Police Lieutenant in the Narcotics Department. His guests consisted of a co-worker, his wife, and his mother. Many controversial questions were asked of this contestant. Some lighter questions included: Have you ever pulled-over a female because she is good-looking? Did you flirt with a female while you were away on a trip? Some of the tougher questions included: Have you ever knowingly put another officer in danger? Have you ever tried an illegal drug in order not to blow your cover? Do you believe there is a lot of corruption in the Los Angeles Police Department? Another contestant will raise some eyebrows, and become what she predicted, “the contestant you’ll love to hate.” Her guests were her husband, mother-in-law, and her best friend. Walberg opened her game by announcing he always gets asked, where do they find the contestants, and why do people want to go on the show? Well, this particular contestant sent-in an audition tape. Producers showed the part of her tape where she explained why so would be good for the show. She stated that she would go all of the way, and has no inhibitions. Once on-stage, she informed Walberg that her desire to be on the show was to “let go of the past” in order for her to move on, and to accomplish some dreams for herself and her three children. She comes from a sordid past, with many skeletons in the closet, along with a rocky relationship with her husband. All this makes for “The Moment of Truth” great television. Most questions were in reference to her relationship with her husband, (he sure did take a beating) and built-up to an ultimate doozy of a question in which, after a long pause by host, Mark Walberg who said to the contestant “I’m not quite sure if I’m ready for this one” in response to the contestant who stated that she was ready for her next question. Her questions included: Do you consider sexual relations with your husband a chore? Do you genuinely enjoy spending time with your mother-in-law? Some tougher questions were: Have you ever fantasied about other men? Have you ever given your phone number to another man while you were married? Have you ever slept with one of your husband’s friends without him knowing about it? Contestants have to complete a number of pyramid questions in order to earn money. 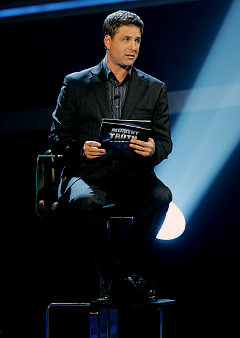 During the first pyramid, contestants must answer six questions. Once completed they earn $10,000. The second is five questions worth $25,000. Then, four questions for $100,000. Three questions to get $200,000. Two questions for $350,000, and finally, one last question to win the jackpot of $500,000. If at any time their question results in a “that answer is false”, they drop back down to $25,000 which they walk away with. Both contestants went for the $200,000 questions. One of the things that “The Moment of Truth” is known for is the game’s tricky questions. Contestants were stumped by: “Do you think you are a good wife?” And, “Have you ever witnessed another officer abusing the law, and not reported it?” Why these questions were considered tricky to these contestants? 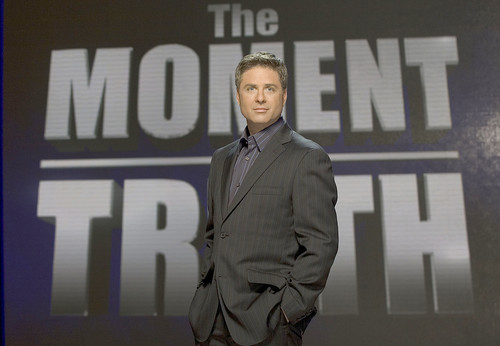 Viewers will have to tune in and find out when “The Moment of Truth” returns to television August 28th. is really a nice program, i love it and like watching it always!!!! !